Read the press release on 10 March 2009 from Minister Mentor’s press secretary about the change of CEO in Temasek below. The following is Temasek Holdings’ news release announcing that Charles Goodyear, who was appointed in February 2009 to takeover as CEO from Ho Ching, will no longer take up the appointment. The Board of Directors of Temasek Holdings (Private) Limited (“Temasek”) today announced an agreement with Mr Charles (“Chip”) W. Goodyear not to proceed with his CEO appointment. Mr Goodyear was appointed a Member of the Board on 1 February and CEO-Designate on 1 March. 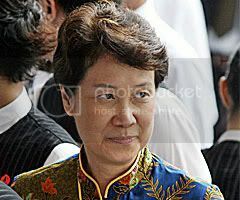 He was to succeed Ms Ho Ching as CEO on 1 October 2009. Four months into the leadership transition, the Temasek Board and Mr Goodyear have concluded and accepted that there are differences regarding certain strategic issues that could not be resolved. In light of the differences, both parties decided that it is in their mutual interests to terminate the leadership transition process and hence the executive relationship with effect from 15 August 2009. Mr Goodyear will also step down from the Temasek Board effective the same date. At the Thomson Reuters Newsmaker Event held on 4 Mar 09, I said that Mr Charles Goodyear was picked to be the next CEO as “there was nobody inside Temasek equal to the job”. Temasek has since corrected me. This was not the case. They stated that Temasek updates its CEO succession options yearly. Their list includes Singaporeans as well as non-Singaporeans, both inside and outside of Temasek, categorised for various timeframes from immediate to a three to five year horizon. Temasek selects new CEOs who have the experience and energy to lead the firm for a good five to ten years. External names considered by Temasek include experienced business leaders or promising candidates who are doing well in their careers. They would be in their 40s to early 50s. Internally, Temasek has several potential CEO candidates, mostly between late-30s and mid-40s. Several have better investment nous than some of the external candidates. They are capable and can be considered for the CEO job at various time-frames. Temasek Board picked Mr Goodyear as its next CEO based on merit. A key consideration was his affinity for Temasek’s values and its position as a long-term investor, committed to delivering sustainable returns. His leadership capabilities, experience and track record will be complemented by the strengths of the current team. The Board was also satisfied that Mr Goodyear has a strong interest in developing people for the long term.